We believe that autism is the defining disorder of our age, man-made and therefore preventable, and that it points to the truth about other problems that beset us, from ADD to asthma to Alzheimer’s. We address those issues as well, along with exposing the special interests, bureaucratic inertia, and medical malfeasance that perpetuate denial and suffering. Since beginning in November 2007, we’ve run hundreds of posts and thousands of reader comments and received millions of hits by people who share our mission. We are here to stay. We depend on our valued sponsors and advertisers, as well as individual donations. 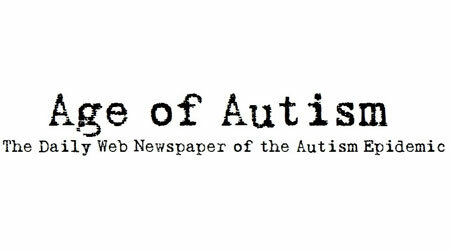 Thank you for supporting the mission of Age of Autism!